Lifehacker has an interesting article on how to use a timer to get more things done by creating a system whereby you dash through your-to-do list; and keep the time as you do it. Trick yourself into starting by deciding to work on the task for just a handful of minutes and guarantee yourself a break at the end of that time. For example, commit to work on your task for 10 minutes. Ten minutes! That’s one minute for each finger on your two hands. Anyone can work on anything for 10 minutes, and that includes you and that thing you’re putting off. First, get a timer—an egg timer, a digital watch, a cell phone timer, a software timer, the kitchen timer, whatever’s available. 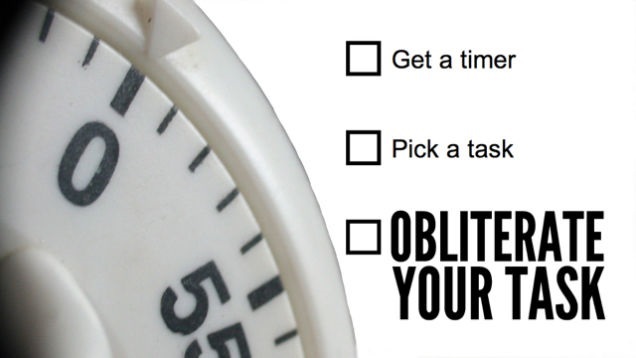 Pick your biggest, scariest, most put-off task. Choose the next action, set your timer for 10 minutes, start the timer, and begin. When the timer goes off at the end of the 10 minutes, stop. Get up, walk around, get a drink, and pat yourself on the back for what you’ve just done: you stopped procrastinating and got started. I thought this was a fantastic Idea! We have these great hourglasses at Office Divvy. We typically use them to keep the time in a meeting, facilitated session, panel discussion etc. But today I grabbed the 30-minute and the 5-minute hourglasses to manage my day and tasks. By the time the hourglass runs out, this post will be up; and I’ll move on to my to-do list, using a combination of the 5 and 30 minute hourglasses for different tasks. What do you think of the idea of keeping a timer as you run through your to-do list? Do you have other proven methods to effectively manage your day and tasks?